Our team at Weissler Law Group is devoted exclusively to solving estate planning and elder law issues for clients in San Diego and throughout San Diego County, California. The priority at our law firm is empowering families take action to prepare for and navigate through life cycle events. We develop and implement forward-thinking strategies to help families minimize conflict and reduce taxes while preserving and effectively passing on their nest eggs. Our team at Weissler Law Group is devoted exclusively to solving estate planning and elder law issues for clients in San Diego and throughout San Diego County, California. The priority at our law firm is empowering families take action to prepare for and navigate through life cycle events. We develop and implement forward-thinking strategies to help families minimize conflict and reduce taxes while preserving and effectively passing on their nest eggs. We feel strongly that no one's life's work should be lost to the unexpected or the expenses of aging. In our own personal lives, we have seen what happens to families when a will is poorly drafted or medical directives have not been laid out in advance. Every day, we help people avoid those battles. Backed by decades of experience, the team at our law firm includes a State Bar of California Board of Legal Specialization certified tax law specialist. Additionally, we hold honors that include an Avvo "Superb" rating and being named a Five Star Wealth Manager by San Diego magazine. Firm members are regular speakers to both attorney and public groups. Starting with a free initial consultation at our law firm, we map out a high-level approach to satisfying our clients' goals. From there, we meticulously move through every detail to protect our clients against unnecessary headaches while at the same time maximizing their potential for the best possible future. Our attorneys take into account family relationships, financial concerns and possible areas of risk. 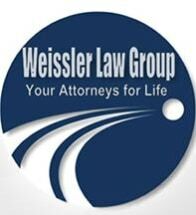 Weissler Law Group accepts credit cards. Mon-Thu 9am-6pm, Fri 9am-5:30pm, Home and Hospital visits available for clients unable to come into our office.